Suggested Serving 8 capsules (6000 mg) daily - Contains 25 servings. Works out to $1.26 per day. 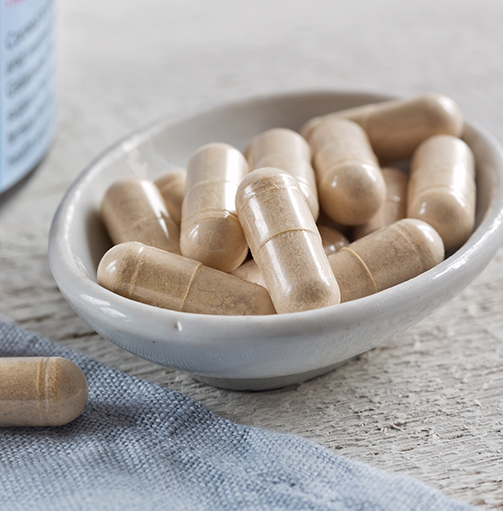 Our Gelatinized Sundried Red Maca Capsules contain our 100% Gelatinized Red Maca powder. All of our Maca powders are carefully and consciously grown, processed and handled. They come from an organic farming co-op near Junin, Peru, the traditional farming area for Maca. We work only with producers who own and manage their lands at a local grass roots level. The co-op of farmers is committed both to organic farming and to producing the highest quality Maca products available anywhere. We're very happy to support their work. Gelatinized Sundried Red Maca is higher in phytonutrients than our other Maca products, and has a very positive effect on hormone health and balance. Some research has also indicated that Red Maca has an exceptionally positive effect on women's fertility and hormone balance and on men's prostate health. Please note that results may vary from person to person. Compare all of our Maca products here. In terms of research on Maca, both Raw and Gelatinized powders have gotten good results in various kinds of studies. On a more anecdotal level we've received positive feedback from our customers on both types of Maca. Our overall experience is that Raw Maca powders work slighlty better than Gelatinized ones. But more important to positive results than the type of Maca powder taken is its quality and freshness. That said, if you have a generally sensitive stomach or any other issue with digestion, then Gelatinized Maca is the best choice you can make. The reason is simple. While Raw Maca can cause temporary symptoms like bloating, gas or upset stomach (in about 5% of people), the gelatinized powder simply will not do so. We also offer Gelatinized Sundried Red Maca in powder in three different sizes. I read on line Maca would help with Restless Leg Syndrome. Anything is worth a try. I was surprised to find other benefits listed when I researched. I thought it might be good for both my husband and I to try for improved health. After taking about 5 -6 capsules daily for several weeks there is no benefit whatsoever. I've still got two containers of capsules in the cupboard with no reason to continue. I switched to Gelatinized Red Maca after raw Maca (from another distributor) made me nauseous and didn't seem to have any other effects. I started with the powder but I'm not fond of the taste, so I switched to the capsules, which are easier for me to take and to carry with me when I need to. Red Maca definitely makes a difference. Before taking Red Maca, at times my premenopausal symptoms were almost unbearable...the night sweats and hot flashes at any given moment during the day made me miserable and I seemed to always look as though I just ran a marathon! I love my red gelatinized maca caps! It is as if they add a youth hormone into my body : my breasts appear larger and firmer ( even more so if I exercise them ) as they once did before menopause. As if estrogen is put back into my body! I didn't realize how potent the gelatanized maca root capsules are..
with that being said I started taking 6 pills a day on an empty stomach. My digestive system was out of control and I now take 1 pill a day.